Tigh Na Bruach’s three en-suite bedrooms "Fort George", "Fort Augustus" and "Fort William" are all on the ground floor, each providing luxury and comfort. Every room has sliding patio doors leading to its own covered veranda with tables and chairs where you have a lovely view of Loch Ness and the hills beyond and can do a spot of monster watching. These also provide you with your own private entrance to your room. The rooms at Tigh Na Bruach are equipped to make your stay as comfortable as possible with flat screen TV/DVD (selection of DVDs), clock/radio/alarm, courtesy tray, hairdryer, comfy bathrobes, fluffy towels and exclusive toiletries, fresh flowers, magazines, books and more. Click here to view more images in our Tigh Na Bruach Loch Ness Photo Gallery. With its loch views and side views over the large garden, Fort George (pictured above) has a comfortable king size bed, dressing table , leather armchairs and coffee table by the sliding doors to enjoy the view. The en-suite has a large shower cubicle, double wash hand basins, wc, electric shaver point and heated towel rail. Named after Fort George at the North end of the Great Glen, dating back to the Jacobite Rebellion in 1745. This is still a functioning military base and a very interesting tourist attraction. Fort Augustus (right) is a spacious double room furnished with warm mahogany furniture, a king size bed, comfortable armchairs and a coffee table by the window with spectacular view of the Loch. Fully tiled en-suite with large shower cubicle, wash hand basin, wc, electric shaver point and heated towel rail. Fort Augustus is named after the pretty village at the south end of Loch Ness where a series of locks join the Loch to the canal system and visitors can while away an hour or two having refreshments by the side of the locks and watching the boats go by. 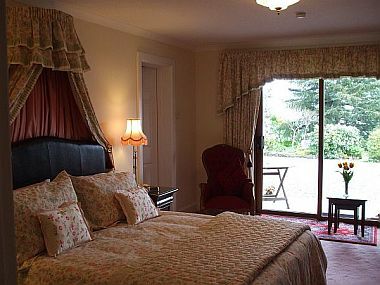 Fort William (pictured below) is a spacious bedroom with its own dressing area, king size bed, a comfortable sofa to relax on and seating by the window to enjoy the view, overlooking Loch Ness to the front and the rose garden to the side. En-suite with large shower cubicle, double wash hand basins, wc, electric shaver point and heated towel rail. Fort William at the west end of the Great Glen and the north end of the West Highland Way, is also home to Ben Nevis, the highest mountain in the UK and Aonach Mor ski resort and gondola. Our bright dining room overlooks the rose garden. Enjoy a delicious hearty breakfast from our varied menu to set you up for the day. We try to use as much local produce as possible. In addition there is a fridge with fresh milk and bottled water always available. Evening meals are available in the village at the award winning Glenmoriston Arms Hotel restaurant or the Glen Rowan Restaurant. For a wider choice, from the local chip shop to hotels and restaurants, Fort Augustus is just 5 miles down the road.